Building a new kitchen or renovating your current one is a big undertaking. So, before you start picking out new appliances, make sure you’ve done your research and know exactly what you’re getting yourself into. 1. Plan your menu first. 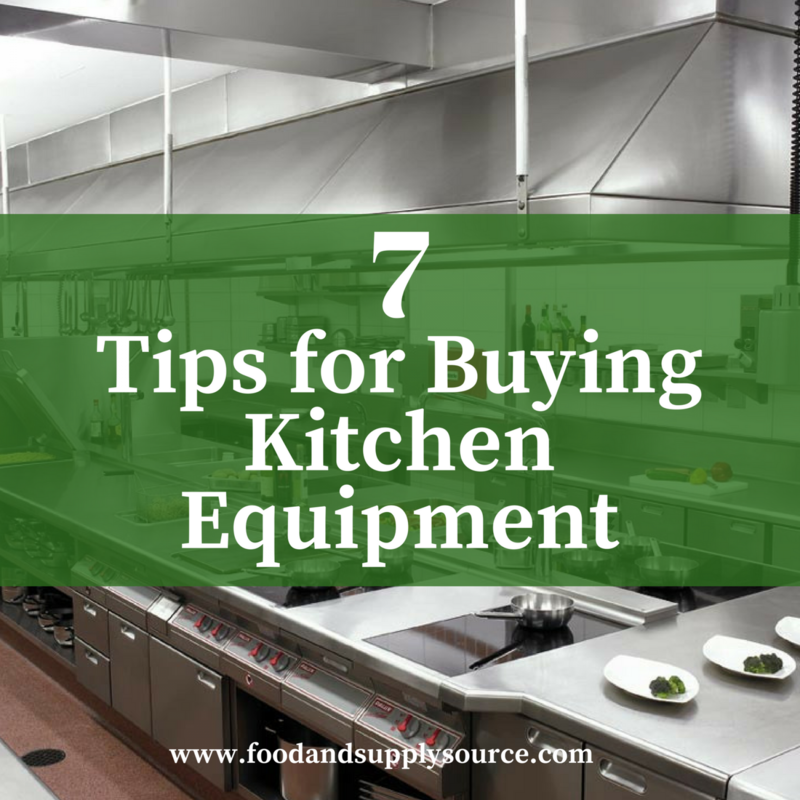 One of the most common mistakes of shopping for new kitchen equipment is wasting your time and money buying things that you don’t need. To help avoid this, before you create a shopping list, plan your menu first. This way, you know what specialty equipment you might want to invest in for your organization and (more importantly), what expensive, specialty equipment you do NOT need. 2. Create (and stick to) your budget. It’s no secret that purchasing new commercial equipment is expensive. When you plan to renovate your kitchen, it’s important to set a budget for yourself – and to stick to it! The key is to find a balance between quality and what you can afford. Of course, you’ll always want the higher quality appliances; it will help to produce better quality food, will work more efficiently, and will last longer. But if you can’t afford all top-of-the-line, determine which pieces of equipment are most important, and prioritize those in your budget. It may seem like a no-brainer, but when you shop for new kitchen equipment, make sure that it will fit in the space you have. Unfortunately, many buyers make the mistake of ordering new equipment without having measured their space – and then it doesn’t fit (or it takes up a lot more room than they expected!). This includes measuring the doorway to make sure that you are able to get the new equipment in the building. 4. Look for the ENERGY STAR® label. When browsing all the types of kitchen equipment and appliances, it can be hard to find what you need in the mix. The initial cost of the equipment and the amount it will cost to run the unit are the most important costs to evaluate. An easy way to pinpoint the most cost-effective products? Look for the blue ENERGY STAR® label. These products are guaranteed to be energy efficient and provide long term savings to the buyer. You’ll find this ENERGY STAR® marking somewhere on the product or packaging. It signifies that the equipment meets the standard requirements defined by the Environmental Protection Agency (EPA). It is a suitable for a commercial kitchen, that it has passed third-party inspections, and that it is food-safe. It’s not required to use equipment with the ENERGY STAR® logo, but, if you do, you can be sure that they will lower your utility bills, last longer than non-ENERGY STAR® appliances, and produce less air pollutants. 5. Make sure to meet all local codes. Failing to meet health codes is one of the biggest nightmares of any Director/Owner. The best way to avoid getting slapped with a fine is to be proactive. Before going shopping for kitchen equipment, make sure that you are familiar with all of the health, building, fire, and other codes of your local area. Remember, local codes vary; the regulations you’re familiar with many different in different locations. If you want to play it safe, meet with inspectors and officials before purchasing new equipment to make sure you’re on the right track. 6. Get informed about warranties. When you shop for new restaurant equipment, don’t get too distracted by the flashy gadgets and features. Remember to read the fine print. Specifically, do your research about the equipment’s’ available warranties. How long does the warranty last? Who do you go to about repair under that warranty? In what instances will the warranty become ineligible? Warranties can be a big money-saver down the road, so take them into consideration during your shopping. 7. Develop relationships with wholesale kitchen equipment providers. When you’re making a big purchase, like kitchen appliances, it helps to consult the experts. They can help you choose the best product for you and ensure that you’re making the right investment. How do you get the experts on your side? Forge relationships with wholesale restaurant equipment providers. Maintaining a good relationship over time can help you out in the long run, as your friendly provider may be able to do a favor now and then, such as providing expedited delivery when you’re in a crunch. Looking for a quality provider to help you find the best price on kitchen equipment for you? We here at Food and Supply Source have done the work for you! Receive up to a 15% discount with Central Restaurant Products. You can browse their full line of products on the Central Restaurant Products website and to get access to the discounted pricing- set up your account here (no obligation to order!). Central Restaurant Products offers industrial kitchen appliances, small wares, refrigeration, cooking equipment, food prep materials, refrigeration, shelving, tabletop supplies and much more. Food & Supply Source works with the best wholesale vendors to help you find the products you need at a convenient price. Vendors are approved for meeting the highest of standards in customer service and quality products.